(1) The countries of West Africa,including Ghana and Ivory Coast, supply 70-75% of the world’s cocoa supply. (2) 1.8 million children work in cocoa related activities in Ghana and Ivory Coast according to a 2011 report by the Payson Center at Tulane University. (3) According to the The U.S. Department of State, the Tulane report also uncovered the harsh hazardous working conditions of these children, finding that 93% of the children are operating tools, 80% of them are carrying heavy loads and 51% of them reported that they were injured while working on the cocoa farms. Ugh. I know. That Hershey bar doesn’t taste so sweet anymore, does it? In 2001, U.S. Senator Tom Harkin and U.S. Representative Eliot Engel created the Harkin-Engel Protocol (also referred to as the Cocoa Protocol) in an attempt to eliminate the worst forms of child labor, including child slaves, from chocolate supply chains and hold major corporations accountable. The major players in the chocolate industry agreed to sign this Protocol in order to stop the implementation of a U.S. bill that would have required labeling all chocolate as “child slave free” by 2005. Instead, the Protocol signers agreed to voluntarily eliminate abusive, forced child labor from all their supply chains by 2005. That voluntary deadline came and went and here we are, years later, still faced with this grim reality. It’s hard to imagine but there is hope. We have the power change this system. Tuna didn’t magically become dolphin free overnight. It was the result of many outraged people putting pressure in the right places. Are you outraged? We are. 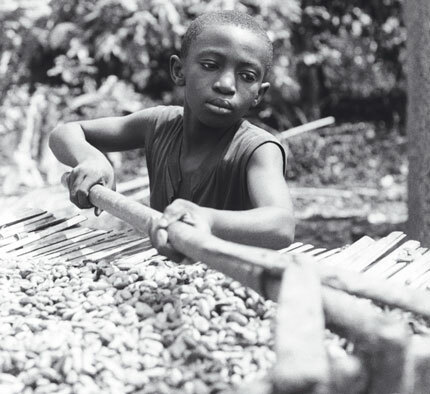 Let’s do our part to put an end to the worst forms of child labor in cocoa supply chains. We are asking you to join our campaign to educate consumers, to encourage your local businesses to use fairly traded chocolate, to pressure the multi-nationals and to petition our policy makers to eradicate child slave labor in these supply chains. *Reach out to our community through presentations, movie showings and fair trade chocolate tastings. *Educate our local restaurants and bakers about their sourcing options. *Collect signatures for the 10 Campaign. *Tell our representatives that this is an important issue to us. *Invite local chocolate companies to learn more about what they can do to eliminate child labor from their supply chains. *Culminate our work with a Fair Trade Event this Fall where we will join forces with our community to take action and to celebrate all of the positive steps being made to end child labor in cocoa.